Saint Petersburg artist Asya Kozina makes paper wigs that pin together extravagance and simplicity. Crafted of nothing but paper and cardboard, they reimagine Baroque-era decadence in monochrome. Several years ago, after exhibiting miniature paper sculptures and noticing that viewers constantly wished to touch them—as though to confirm they were indeed made of paper—Kozina decided to make something people could pick up, handle, and wear. After completing and exhibiting a first set of wigs and dresses in 2012, she has continued to push herself and explore new motifs, from Mongolian wedding fashions to the Baroque wonders you see here. After working on fairly traditional remakes of the over-the-top wigs worn during the Baroque period, the Russian artist decided to integrate present-day symbols into her intricate creations. 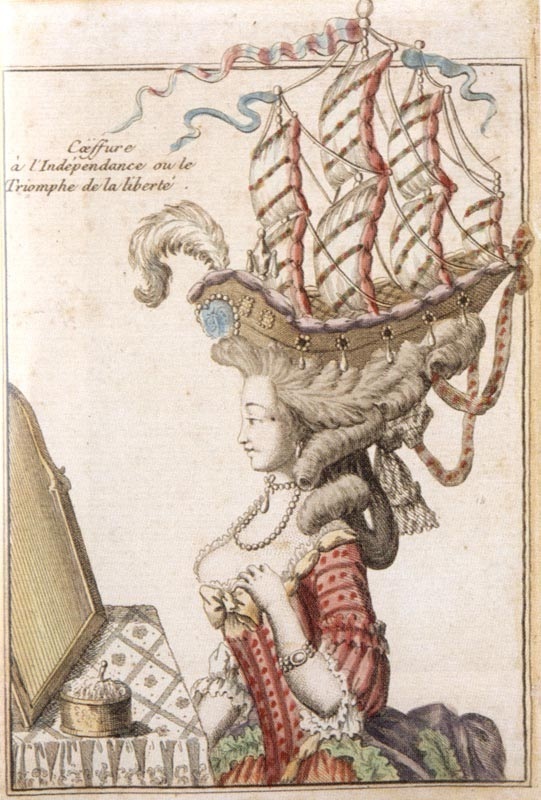 Just as an 18th-century stylist might have opted to accessorize hairpieces with birds, feathers, or an entire ship model, Kozina balances planes and contemporary architecture atop her models’ heads. Kozina works entirely by hand, from concept to execution. After studying historical materials, she draws a detailed sketch. Her husband Dmitriy then sculpts the underlying structure out of tough cardboard, while she prepares the strips that will give the wig its outer texture. “Then we add the larger elements, like curls," explains the artist, "and make changes as we go along, adding or subtracting decorative elements like flowers, feathers, and leaves." Next, Kozina wants to experiment with new techniques and tackle other kinds of headpieces. “Work on the wigs continues, but I’ve been sketching hats lately.” Perhaps we’ll catch her first adventures with millinery soon, hopefully on her eye-catching Instagram. To see more of Asya Kozina’s paper creations, visit here.